Right in a Left World: Hamas Supporters Protest In LA, "Long Live Hitler"
Hamas Supporters Protest In LA, "Long Live Hitler"
As was previously shown in The Big Lie and the True History of Palestine, this is how our streets are becoming littered by supporters within our own country of the Palestinian terrorist organization, Hamas. The world seems outraged that tiny Israel has finally tired of the daily missile and rocket attacks and decided to defend them selves by attacking Hamas in Gaza. Israel ceded Gaza to the Palestinians a few years ago falsely believing they might find peace. It has been nothing more than a staging area for attacks upon Israel since by Hamas, who has sworn a blood oath to destroy Israel. From Ft. Lauderdale, Florida and now to Los Angeles, California, American supporters of Hamas have taken up chants of “Go back to the ovens,” “Long live Hitler,” and “Put Jews in Ovens” by these supporters of Hamas. 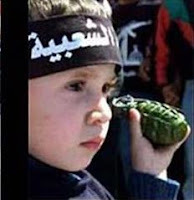 Hamas hides in schools, behind women and children and attacks Jews across the border. Of all the world’s outrage expressed, I have yet to hear a serious call for Hamas to just stop lobbing missiles and get on with living their lives. While we have free speech rights in America, this is uncalled for and overboard. If these chants aren’t trying to incite violence I don’t what is. Israel has repeatedly demonstrated its commitment to peace only to be attacked once again and then condemned if they dare defend themselves. Of the Arab nations Israel has found peace with, none have to defend them selves against Israel and none have had reason to attack Israel. 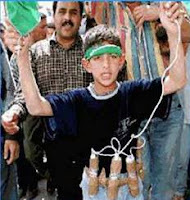 Isn’t it time Palestinians in support of Hamas tried loving their children more than hating Jews? UPDATE: Pamela Geller of AtlasShrugs shows us that plenty of supporters of Israel came out too, acting quite a bit more civilized.